Modifications: I decided to go with a scarf size instead of the full on shawl mostly due to the fact that I only had one skein of this gorgeous seasilk yarn. I did the set-up rows as written and did about 6 repeats of the increase rows. Then I played the game of how many rows should I do before I start decreasing without measuring! I scientifically kept juggling the ball of yarn in one hand and the scarf in the other trying to determine how much was left. In the end I had a little ball left over which could have been used for a couple of more repeats… but I am not upset, this scarf is GORGEOUS! It’s got the most beautiful sheen and drape. A perfect accessory to dress up any outfit! Otherwise, things in Chez Tentenknits are good! I went to my college reunion last weekend and enjoyed seeing some old familiar faces while pretending to be in college one more time. I have a feeling that this weekend in OH will rival the "college" weekend… Knit Keg Stands anyone?? I kid. I kid! If by any chance Brooks Farms is there and they are selling to retail, please try to talk Patricia into getting some of that. I always stock up at Rhinebeck but I would love to be able to get it locally. It’s beautiful! Perfect accessory. And perfect match of yarn and pattern! that is beautiful! 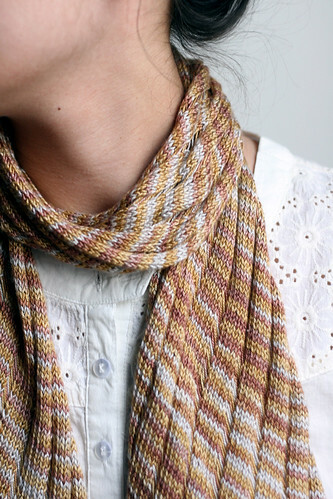 i love the size – if I was ever to do one, it would be a scarf! Yay- it looks fabulous! That yarn is just gorgeous, too! I have two skeins of sea silk and haven’t done anything with them yet- waiting for the right project(s). I think I will definitely use one of the skeins for a clapotis scarf. Gorgeous Clap! Be sure to stop by the Alchemy booth- I’ll be there and I would love to meet you! Oh I keep putting off Clapotis! Thanks for the reminder! Clapotis looks incredible. The colours are just perfect and I can use you will get much use out of it while feeling tres chic! I think that yours has to be my absolute favorite one! It’s gorgeous! hey, i will be at tnna! i’m running my lys fri/sat so the owners can head down and then i’m headed down saturday evening and will be there sunday and monday (i get to take classes! woo!). Very pretty. 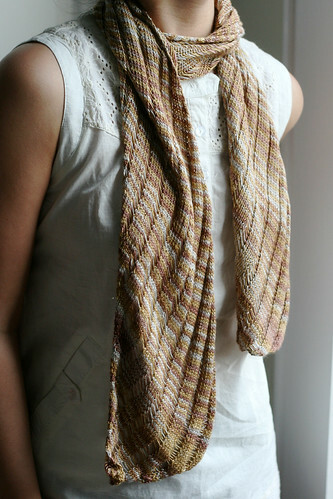 I've yet to make a Clapotis, but it's on my list of things to do. I might have to use the seasilk too! So so pretty! I love the colors, and the scarf looks fantastic. I like it. I really like the colors of your Clap. I have yet to join the Clap Club. Ooh, that seasilk clap is gorgeous! great job, and no doubt going to be a wardrobe staple. I love the Clapotis! Never get tired of seeing them. Have fun in Columbus. I’m jealous. All of this is going on in my backyard. Gorgeous! I made one last year using the SeaSilk [in Ebony]. I like that. The biggest thing to me is being true to yourself. That is the goal that I have every day and I hope I accomplish that.